Enough with frolicking at Rome’s historic fountains. 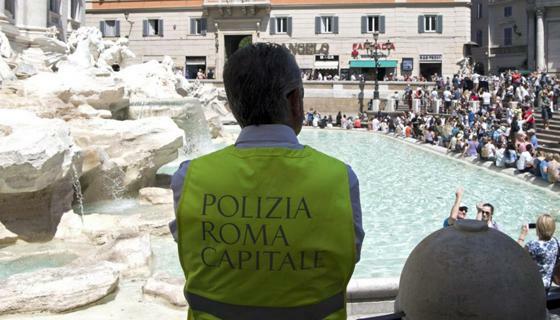 Rome mayor Virgina Raggi has issued an ordinance which forbids people from eating, bathing, climbing over or sitting on the marble pedestals of the city’s landmark fountains, including the Trevi Fountain and the Barcaccia Fountain by the Spanish Steps. The fine for breaking the ordinance starts at €40 and goes up to €240. The measure, valid until 31 October 2017 (basically for the peak summer season, but why not make it permanent? ), specifically bans the following: picnicking and camping out; eating and drinking; climbing over, wading and bathing; pouring liquids; throwing objects, except for the traditional launch of coins; washing pets and clothing; giving water to pets. The decree comes after several questionable, to say the least, episodes: a couple of newlyweds entered the Fontanone at the Janiculum Hill for their wedding photoshoot; at Easter, two tourists from Denmark were caught with their legs up to their knees in the Fountain Due Mari by the Vittoriano monument and fined €450 each. Apparently, they thought it was perfectly fine to use a public, historic fountain for a footbath. At the beginning of April, a Roman man bathed, half-naked, in the Trevi Fountain. Last September, six drunken British architects stripped off to take a late-night dip into the Fountain of the Naiads on Piazza della Repubblica. Among the 40 fountains touched by the ordinance are: the Trevi Fountain, the Barcaccia Fountain by the Spanish Steps, Fontana dei Quattro Fiumi, Fontana del Moro and Fontana del Nettuno on Piazza Navona; the fountain at Piazza Santa Maria in Trastevere; the Triton Fountain on Piazza Barberini; the Due Mari Fountain in Piazza Venezia; the fountain of the Naiads in Piazza della Repubblica; the fountains on Campo de’ Fiori and on the Piazza d’Aracoeli.